Diameter: ~55 mm (2.165 in); Step: 4,0 mm (0.157 in). Lyapko needle ball applicator is a massage ball designed to give active massage to reflex zones and acupressure points located on the human body. It helps develop fine motor skills and touch sensibility, improve the function of the nervous, cardio-vascular, skeletal, digestive, immune and other systems. Boosted therapeutic effect produced by the massage roller ball is achieved due to its design features as well as distinct reflex and mechanical, galvanic and electric properties. For disorders of nervous system conductivity and mental activity it is recommended to stimulate the zones on the palms and feet which are the projection zones of all vital organs and systems of the body. Such local stimulation helps develop fine motor skills and tactile sensitivity in the extremities, promotes development and restoration of brain functions. Lyapko Needle Ball Applicator is good to be used for "finger gymnastics" widely practiced by pediatric psychologists, valeologists, logopedists, recreation therapists, neurologists and speech pathologists (doctors who work with children suffering from speech delay, psychomotor development delays, neurodevelopmental and neuromuscular delays, logospasms, ICP and other illnesses). • to combat stress. When you massage the hand with the massage balls you stimulate a lot of nerve-endings and acupressure points located on it, which relieves stress and brings a pleasant feeling of relaxation. To relieve pain and produce sedative effect apply Lyapko Needle Ball Applicator to the zone of pain moving counter-clockwise from the center to the periphery. The time of the session is 15 – 20 minutes. To produce toning up effect massage the points of general spectrum moving clockwise from the periphery to the center. The time of the session is 7-10 minutes. First aid. In an emergency (loss of consciousness) apply Lyapko Needle Ball Applicator to the tips of the fingers, toes, ear-lobe, the tip of the nose. Massage for 20 seconds then make a pause for 15 seconds. Repeat 2 or 3 times. For pain syndrome Lyapko Needle Ball Applicator should be applied to the zone of pain or to the symmetrical zone (follow the schemes of acupoint location). Time of stimulation is 5 – 10 – 20 minutes. For trifacial neuralgia, sympathalgia and toothache apply Lyapko Needle Ball Applicator additionally to the most painful zones (for 10 – 30 minutes) and to the symmetrical zones (for 2 – 5 minutes). You can also stimulate the earlobe of the unaffected side. 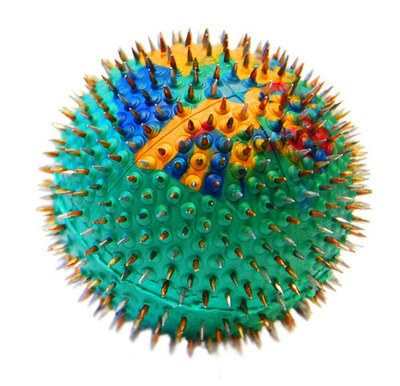 Lyapko Needle Ball Applicator can be successfully used as a hand and foot massage ball to stimulate reflex zones according to Su Jok therapy. If you have any problems with internal organs, carefully study the picture with the scheme of points on the hands and feet and the organs they correspond to. Identify the zone corresponding the affected organ. Apply Lyapko Needle Ball Applicator to this zone, press, and massage. Regular massage of the reflex points on the hands and feet can significantly improve the condition of the affected organ.